I was looking back at my younger self listening to music and writing my own song lyrics, sometimes I did not even write lyrics but composed songs there and then and sang them changing words and tunes as I pleased. As I reminisced, I thought why not try writing songs again and that’s what I did. Writing became a means of letting my inhibitions go, exploring situations that has impacted me and others and bringing clarity to them. Most of the poems written are personal ones, in that they are my own experiences. “Living Nightmare” when I experienced some strange things while sleeping and was consciously aware of what was going on. “The Betrayal” is based on finding out that someone very close to me whom I confided in a lot and thought had my back did not. The discovery of the betrayal came as a massive shock. “Did I tell you of him” is based on the death of my brother, Michael. The death of a loved one never really leaves you, you take them with you wherever you go. These are just a few of the poems and the stories behind them. Writing about my experiences has been cleansing in a way as I have had to face up to the fact that within me I carry a lot of pain and hurt from my life experiences. I also carry with me hope, faith and love. Life is a mix of adventures isn’t it? 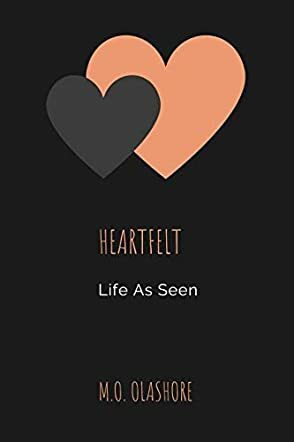 Heartfelt: Life as Seen by M.O. Olashore is a collection of deep poetry formulated from the author's life experiences and the experiences of those around her. Olashore brilliantly touches upon the pain and peace that come with living life. Her book is split into two parts, Heavy Heart and Light Heart, both hitting different subjects. Heavy Heart is about grief and pain, as well as friendship amongst others. Light Heart is all about love, peace, hope and faith. Heartfelt takes the topics that are hard to digest and pulls you outside your comfort zone. Her poems will evoke self-love and understanding, emotional pain and betrayal, all in the hope of showing you that the worst gets better. We all go through life experiencing ups and downs and this little book of poems is a rendition of the author's experiences. I enjoyed reading the book because some of the poems resonate with me. It was like going on a spiritual journey with the author. A refreshing selection of poems. M. Olashore gives a glimpse of the world and life through her eyes. She teaches us about human nature, friendship, family and life in general. Heartfelt is engaging and enthralling. Heartfelt, Life as Seen by M O Olashore is an honest and open account of the author's life. The book is in two parts offering poems and short stories, all are beautifully presented and written. You will read this book over and over again as your life experiences grow.